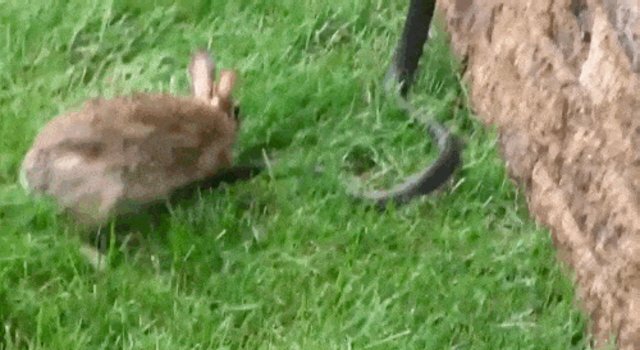 An incredible video shows a mother rabbit relentlessly pursuing the snake who killed her babies. The mother rabbit returned to her nest to find a large black snake curled up on top of her babies. Two were already dead, but at least one little rabbit was still alive. In the video, the mother rabbit jumps onto the constrictor, loosening his grip so one of her babies can escape. She pauses to lick one of the other babies - and when she realizes he's gone, she goes full-on angry mom on the nearby snake. Jumping fearlessly onto him, she bites his neck to hold him still while she batters him relentlessly with her hind legs. When he tries to escape, she follows, attacking him again and again. 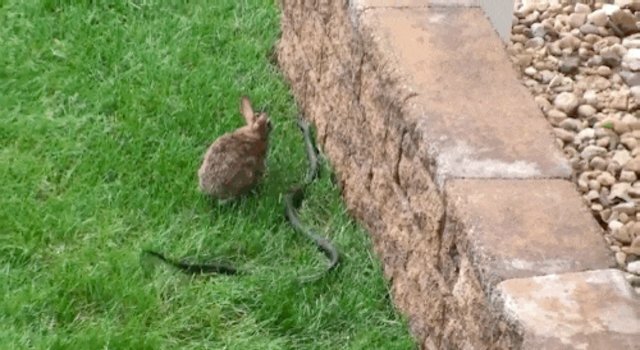 At one point he tries to slither away up a nearby wall, but the mother rabbit yanks him down again with her teeth so she can give him another beating. The desperate snake finally reaches out to strike her - but she gives him a full-on backflip kick before running away, returning a few seconds later returns to keep up her attack. Of course, snakes need to eat too. But we can't help but cheer for this determined mother, especially since rabbit moms are usually hands-off - to avoid attracting predators, they cover up their babies in nests and return only twice per day to nurse. And if the mother rabbit was in fact bitten, there's good news. David A. Steen, a snake expert and assistant professor at Auburn University's Museum of Natural History, told The Dodo that the snake was a nonvenomous black rat snake - meaning the mother and her surviving baby likely walked away fine. This isn't the first time an attack rabbit has been reported. In 2009, an Australian man found dead snakes covered in bites littering his property each morning. 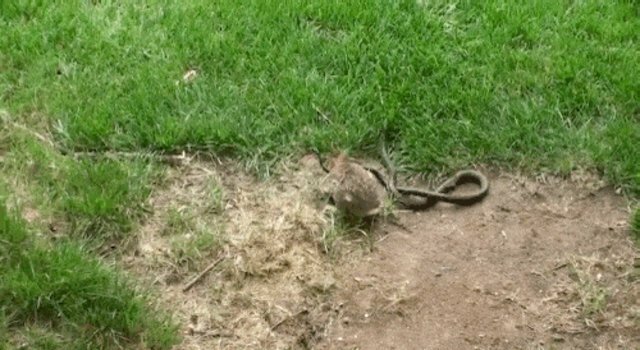 He thought they were the work of his dog - until he spotted a pair of rabbits killing yet another snake on his front lawn.